Above you can see the estimated tax rate for 1918 and what portion would go to each committee and organization that the City had committed funds to, as well as the Provincial War Tax and Patriotic Tax of 1 mill each that they had to levy per the direction of the Federal and Provincial Governments. The two War Taxes would collect an estimated $26,453.50 each, or $414,753.09 in today’s dollar. 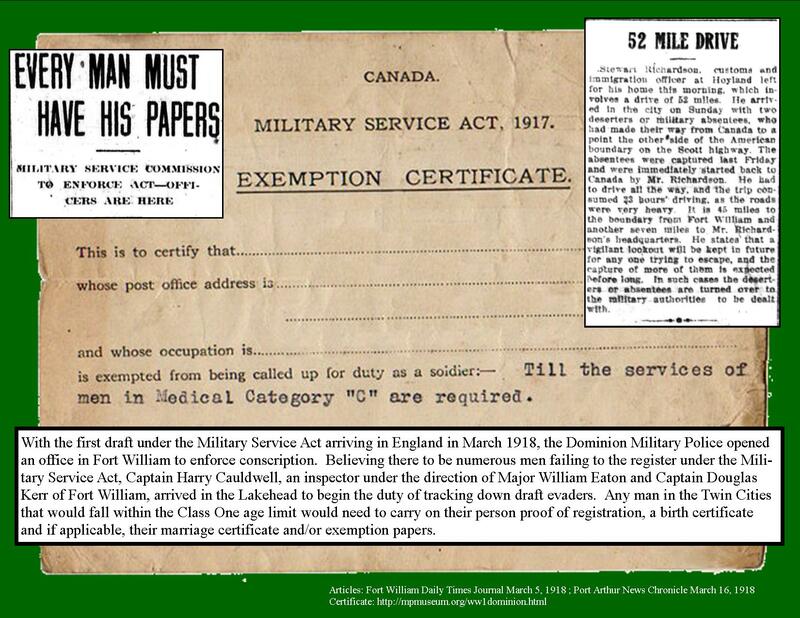 The Provincial War Tax had to be sent to the Ontario Government, but the Patriotic Tax funded the local patriotic initiatives such as the Patriotic Fund and the Red Cross. We can also see that the Garden Club was to be given an estimated $1,000, or $15,678.57 in today’s dollar. Funding for the 94th Battalion’s Band Instruments was granted in January 1916 to be provided equally by both cities and through various fundraising efforts. 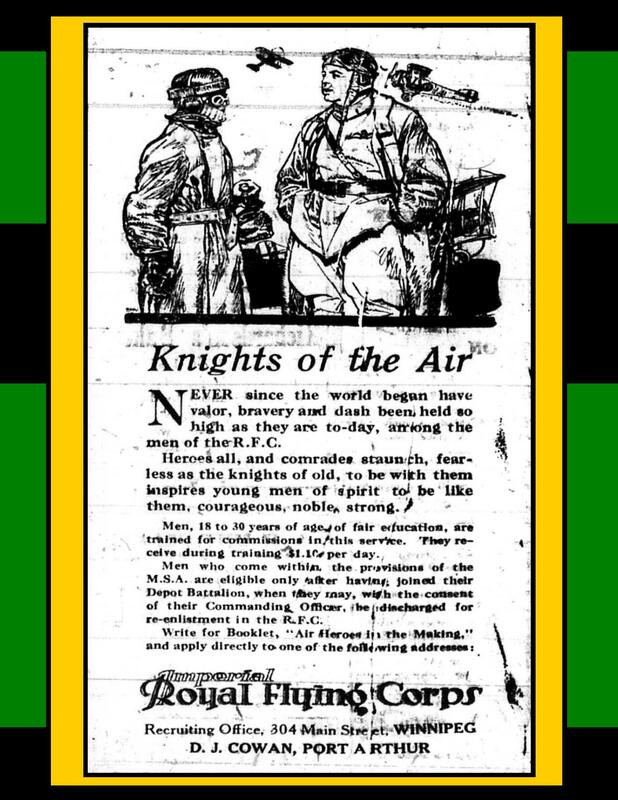 After the 94th had been separated and integrated into other battalions at the Front, the City of Port Arthur wrote to Col. Machin in August 1917 to have the instruments returned to them for the use of the Port Arthur City Band and more communication happened in December 1917. Here, the Property and Fire Committee have had a delegation to their meeting from the Port Arthur Band asking about the instruments. The Property and Fire Committee recommend that someone (they don’t know who and have left it blank) be communicated with to ask what is happening with the instruments and that it is the desire of Port Arthur City Council that the instruments be returned to this City. They recommended also writing to Col. Machin again and to Brigadier-General Hogarth, who was Quartermaster-General for the CEF and Port Arthur’s MPP. This report from the Garden Club talks mainly of the prizes and competition rules. In point 1, Alderman Sterling has offered $50 for prizes which the club must decide on the “best manner in which these can be offered so as to secure the greatest results.” And in point 5, a Mr. Burriss has donated a cash prize of $10 to encourage potato growing, where competitors must grow 396 ft of potatoes and the winner will have the greatest weight of potatoes. Those intending to compete have to register with the City Clerk no later than June 27 and all prize-winners will be required to exhibit at the Garden Club Exhibition in September “or forfeit their prize”. They also decide to ask Council to provide manure, ploughing and harrowing to soldier’s wives and widows free of cost as had been done the previous year. 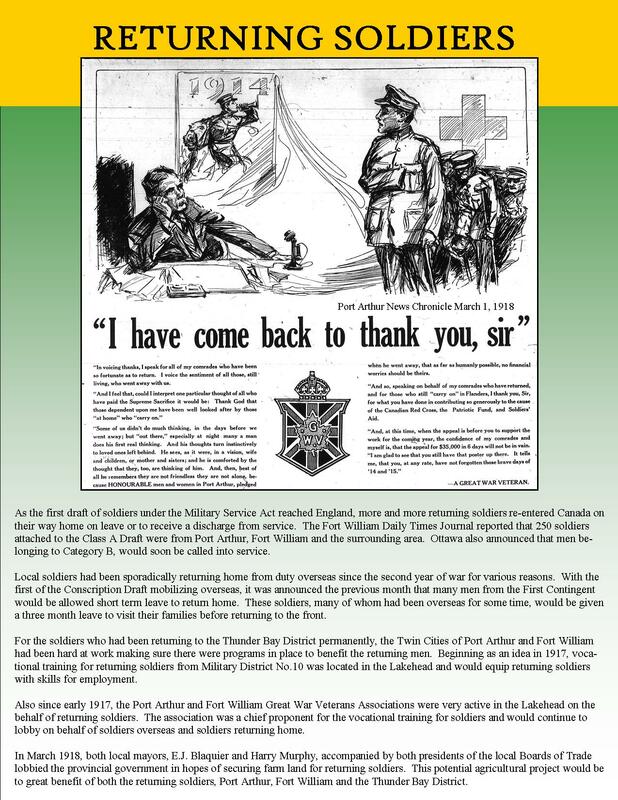 Port Arthur City Council received a letter about the National Burial and Memorial Scheme for Soldiers from W. Ormiston Roy, a landscape architect and the Superintendent of the Mount Royal Cemetery in Montreal. He had a plan to mark every Canadian Soldier’s grave, no matter where he was buried, with a bronze maple leaf set into the ground. We unfortunately don’t know what Port Arthur City Council discussed about this scheme. Unfortunately, we do not have the letters written by the Local Fishermen regarding “the Fish Question”, but as it was referred to the Food Control Committee along with a letter from the Sales Branch of the Government Fisheries, we can guess that some controls were about to be imposed on the fishing industry. More is discussed in the Market report March 13, below. Read the Article about Food Control. The Fort William City Council was asked to appoint delegates to meet with other delegates from each city’s Board of Trades and Port Arthur City Council to discuss the “Government Land Settlement Scheme for returned soldiers.” Fort William’s Mayor appoints three Aldermen to be delegates. 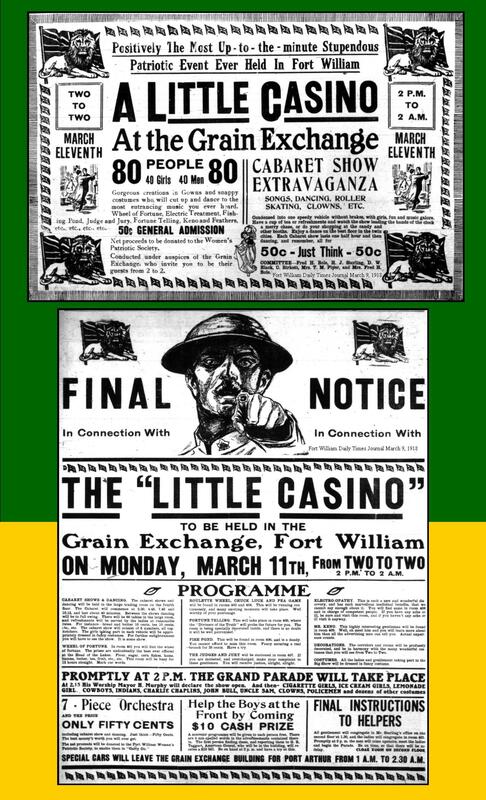 The 1917 Soldier Settlement Act, made land grants and loans available to all soldiers. This Port Arthur Market report interestingly shows that the City was operating as a wholesaler for fish and pigs, acquiring them at a presumably good price to then be sold on from the market. This may be part of the food control over the fishermen that was discussed March 4 above. Council approved the purchase of fish from Orient Bay on Lake Nipigon at $0.11/2lbs to be sold retail at $0.25/2lbs and sold to butchers at $0.12/lb to retail for no more than $0.15/lb. Council did not approve the purchase of fish from the Dominion Fish Company and referred it back to the Market for more investigation. They also approved the purchase of 29 pigs at a price of $14.00/pair from a Mr. Roy Bingham of Murillo, to be delivered to the market at 7 weeks old. They also approve the wording of the lease form for the 5 acres blocks of land in the Strathcona Addition as was discussed in February. Port Arthur City Council received a letter from the Minister of Public Works regarding fish consumption that was forwarded to the Food Controller for the City. A letter was received back from Col. Machin with information regarding the 94th Band Instruments. As was discussed March 4 above, the School Teachers had two meetings with the Market Committee regarding the Garden Club and Children’s Gardens. As the City Council of Fort William (above) was invited, so is the City Council of Port Arthur invited to send delegates to discuss the Government Land Settlement for Returned Soldiers and Sailors with the Boards of Trade and will send three representatives. 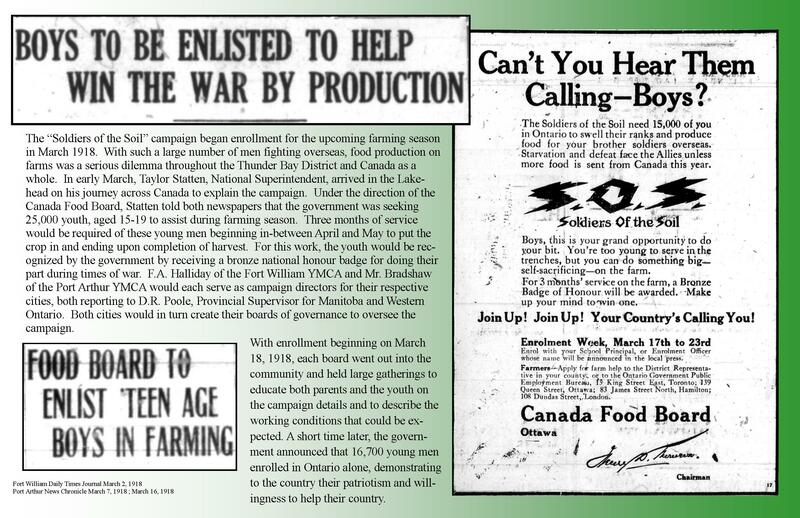 There was increasing pressure due to food shortages, the City of Port Arthur wrote to Ontario Premier Hearst to urge the government to declare one half day a week as a half holiday “so that maximum effort can be made in increasing production.” This half-holiday would be Province-wide and cover all commercial, industrial and professional sectors. Port Arthur City Council met with the Garden Club, Board of Trade, Parks Board, Local Food Control Committee, the Farmer’s Club, and the Rotarians regarding food control. They were discussing a scheme that would be led by the Thunder Bay Production and Conservation Association, a Rotarian idea created as an entity whose sole purpose was to promote production and conservation in the Lakehead. They write the Mr. Keefer in the Department of Agriculture about the scheme. You can read more about the TBPCA in the essay, Victory in the Kitchen. Port Arthur City Council receives a letter back from Mr. Keefer regarding the food production and conservation scheme of the Thunder Bay Production and Conservation Association and refers it to the Market Committee. Things are progressing with the joint discussions about the Soldier Settlement Scheme, as funds are approved by the Finance Committee to send the Mayor and the President of the Board of Trade to Toronto to further discuss the scheme. They also approve that, out of one mill rate, the Patriotic fund should be given $14,000, the Red Cross $2,000, and the Canadian Club $1,000. Fort William City Council received a letter from the Trades and Labor Council regarding the administration of the Patriotic Fund. Fort William City Council endorses the Board of Trade in sending a memo to the Government regarding military protection at the Dog Lake Dam. Canadian Car and Foundry started production on the Minesweepers in May 1918. Here, in preparation for that production, they ask the City for permission to build a temporary railway track across the street railway tracks at Montreal Street in order to access the waterfront. Fort William City Council pledges its support of the construction and operation of the temporary track.